“What was the matter with it?” Kutta asked, as soon as they were all safely inside, with the door shut tight. She had collapsed at once onto the comforter, looking weary, but more alert than she had been. The meat and the sleep, it seemed, had done her some good. “You mean with the hulker?” said Mhumhi, who was pacing on three legs by the door. He’d landed on his bad foot during the struggle, and it had flared up with pain again. “That wasn’t a hulker,” said Maha. They both looked at her. She was sitting with her arms around Tareq, hugging him close. Tareq looked like he didn’t have any idea what was going on, but Mhumhi thought he seemed pleased about the attention. “No, it wasn’t,” Mhumhi agreed, after a moment. He thought Maha was reacting to her fright at the experience, but he also thought she was right. The thing had not moved, sounded, or smelled like any of the hulkers he had seen. Kutta said nothing, but Mhumhi could sense her discomfort. He went over and licked the wound on her shoulder. “It couldn’t have been a hand,” said Kutta, her ears going back. “It didn’t have fur,” Kutta broke in. “Adult hulkers have got more fur than the puppies,” said Kutta. Kutta made no response to this, just favored Mhumhi with her own yellow-eyed stare. “What are you trying to say, Mhumhi?” asked Maha. “I don’t know,” Mhumhi admitted. “Only it seems like- it seems almost like” He paused. The words he wanted to say would sound foolish, and he could picture what Kutta’s scornful reaction would be. He glanced at Maha. “Mhumhi, don’t be ridiculous,” said Kutta at once. “I thought so too!” said Maha, hugging Tareq to herself. Kutta glanced at her, then gave Mhumhi a fierce look. “It wasn’t a hulker,” said Maha, but quietly. Kutta did not seem to hear her, for she was putting her head down, looking weary. Mhumhi could tell she was tired, and beginning to be cross, so it would be better for her to be left alone. But he didn’t think his idea had been that far-fetched. He whined again, thinking of her. He wished he had not. Every moment he was not thinking of her, it seemed like she was still there, still waiting somewhere… Every time he thought of her, he had to remind himself that she was dead. Had the hyena that had eaten her once been hulkers? He reared up at the sink, his bad leg trembling, thinking he’d better get a drink of water. He happened to glance at himself in the mirror and got a shock. His face was still coated in the blood of the hulker. Long since dried, it had left his fur coarse and blood-colored all around his muzzle and eyes. He looked wild and savage. Frantically he pawed at the handle of the sink, clawing at it, but it was a smooth knob and his claws could not grip it. His bloodied face bobbed in front of him in the mirror, mocking. He uttered a whimper, scratching and scratching, but the handle would not turn. He hesitated, then fell back on all fours. Maha was standing in the bathroom doorway. “Yes?” he asked, keeping his voice even. Maha looked unusually timid. He did not answer. She crept past him and used her hand to turn on the water. He looked at his paws a moment, then reared up to lap at the little trickle, his leg shaking. He let himself drop down again. She was sharp, this little hulker, this puppy. To his surprise, Maha turned around and left the doorway, but she reappeared just a moment later with the yellow bowl and a rag. She filled the bowl with water again and then dipped the rag into it. Mhumhi had assumed, perhaps naively, that by washing she had meant she was going to lick him, but of course she was a hulker and he’d never seen a hulker actually lick anything. Their fat tongues weren’t meant for it, he supposed. Either way he was somewhat startled when she put the wet rag on his muzzle and jerked away. Mhumhi was having mixed feelings, as mollified as he was feeling by the gesture, but he held still and let her grip his lower jaw as she passed the rag over his face. Water dripped through his fur from the first few strokes. He blinked rapidly and winced- her scrubbing was becoming more enthusiastic as she went on. Between rubs he could see her little face wrinkled together, her brow furrowed down, her eyes focused on the task. With some misgivings, he rose up to the sink again and looked. To his surprise his face looked damp, but black again. He wagged his tail- it felt like the first time in a while. When he got back down on all fours Maha was smiling at him. “It’s all right,” said Maha and she went and hugged him, a motion that was becoming all too familiar to Mhumhi now. It was almost pleasant, really. He wagged his tail again, though then he saw the bowl on the ground behind Maha. The rag was turning the water red. He gently pulled back from Maha’s embrace, licking his lips. “I was wondering,” he began. She sat back on her haunches and looked at him with that particular wide-eyed expression, and he felt the need to turn away briefly to master his embarrassment. “Why’s that a problem?” Maha interrupted. “Why can’t you go the way you went today?” Maha interrupted, again, and Mhumhi cringed internally. He had been hoping she wouldn’t ask that question. 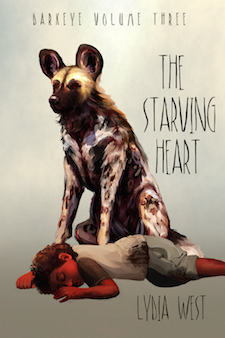 He entertained the macabre thought of what her reaction would be if he told her the truth: Maha, I watched a group of wild dogs kill a hulker like you, and then I put my head inside his chest and ate his heart. “I promise I will,” said Mhumhi. They went together back into the main room and Maha left him to snuggle Tareq again. Mhumhi went to Kutta’s side and hesitated. She was curled up, her nose tucked in her plumed tail, and breathing deeply. He wanted to confide in Kutta what his plan was, but now he was having misgivings. She might say it was too dangerous, or worse, she might refuse to cooperate with him. Mhumhi had instinctively held it back from Maha for the same reason. But if he and Kutta were going to survive, they had to get rid of the hulkers. He did not like the fact- considerably less so than he would have a week ago- but it was the truth. The longer that he and Kutta were bound down in the sewers, the more dangerous it became. Their hideaway had already been discovered by the strange hyena-laughing hulker, and he was afraid that she would return with reinforcements. The longer they stayed, the more his anxiety would mount. It was not safe. And Kutta was sick. The cold and filthy surroundings would not help her. And- there was yet something else- the longer they stayed hidden away, the less chance they had of ever finding Kebero and Bii again. He felt a little pang for Kebero especially. He had not allowed himself to entertain the idea that the little puppy was dead, but… where could he be? He shook himself, trying to rid himself of terrible thoughts, and went and sat by the door, panting. Being attached to the hulker puppies was too dangerous. Tomorrow, if Maha could open a safe way for him back into Oldtown, he would seek out the only lead he had- the adult hulker in the school. And he would deliver the puppies into its care. “it seems almost like” He paused.” need punctuation after like, and depending on which punctuation, he may or may not need to be capitalized. “Had the hyena that had eaten her once been hulkers?” hyenas? “that particular wide-eyed expression,” particular, or peculiar?